Do you plant a spring garden? If so, what do you plant? It’s spring, and I’m getting ready to plant my garden. This year, I’ll be planting basil, oregano, jalapenos, tomatoes and marigolds. I plant a combination of seeds as well as full-grown plants. There’s just something about spring and gardening that makes me joyous. I think my feelings are all about Jesus. Let me explain a little bit. When God lovingly created the Garden of Eden, there were numerous plants and trees growing there, providing nourishment for Adam and Eve. Yeah, we know what happened in that garden…eventually. However, when I think of plants and seeds, I remember the perfection that once existed thousands of years ago. Whenever I plant a seed into the rich dark soil, I care for it by making sure it receives sunlight and water. That tiny seed will slowly sprout into a wonderful plant. I love to watch the plant thrive to maturity so that it provides food for my family’s table. Whenever I pick a fresh tomato from the vine or pull a jalapeno from the stalk, I find myself thinking about God providing for Adam and Eve. I also think about how the Lord still provides for us by providing plants to eat, as well as beautiful, stimulating flowers. Whenever a plant grows from seedling to thriving plant, I just feel as if it’s a miracle, straight from the Lord. Seeing and smelling these wonderful plants makes me joyous, and I’m just so tickled to plant my garden each year. So, do you plant a garden every spring? If so, what do you plant? 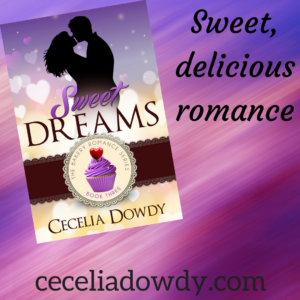 My novel, Sweet Dreams, is on sale for 99 cents for a limited time! Come check out this sweet, wonderful story about a single mom and an amazing baker! I plant a few spring bulbs. I use to try to grow tomatoes but they don’t grow where I live now. Marigolds are good to put with veggies as they are meant to keep bugs away. I am putting in some hollyhock seeds at present for next summer. Hollyhocks look so lovely! Yes, I’d heard that marigolds keep the bugs away. I’m planting some white marigolds this year – first time I’ve ever planted white ones! Too bad the tomatoes don’t grow where you live now. Hi Cecelia! I have never started plants from seeds. Do not room indoors and in Michigan we do not plant outdoors until after May 10th due to late frosts. I purchase plants from a greenhouse around Mother’s Day. I usually plant geraniums and impatients in pots and 2 or 3 tomato plants as vegetable. Michigan is an agricultural state and we have many Farm Stands, plus the local grocery sells local produce. Purchased your book. I enjoy your Bakery series. What a neat way to relate gardening to Jesus! I plant a few flowers and tomatoes, zucchini, and cucumbers. I’ve been trying unsuccessfully to grow sunflowers but maybe this will be my year! So glad you like the way I relate gardening to Jesus. My mind is always thinking about the Bible. Seriously! I often wonder what the Garden of Eden looked like! I want to see a real photo! LOL! I tried to plant cucumbers one year and it was a disaster. I planted them in a large container. The soil was always soaking wet and the few cukes that sprouted were the size of small round balls. Not mature at all. Not sure what I did wrong. I never tried growing cukes again. Have you ever had zucchini bread? When I was a kid, my mom used to make it during the summer. Folks would give us lots of zucchini and that’s what my mom used to make with it. I’ve never tried to grow sunflowers before. Sounds nice, though! There’s been an occasional year where we haven’t planted a garden. It used to be super big and meant to supply all the onions, peas, corn, tomatoes, beans, potatoes (and a few other things) that our family could consume in a year. Summer and fall were very busy with harvesting, canning, or freezing so many vegetables! We’ve cut back considerably in recent years, but yes, so many spiritual metaphors to be found in the garden! Here we are having unseasonably late snow. Some years we’ve been able to plant lettuce, peas, and other cold-weather crops by now. Not this year! Yep, we had some late snow about a week ago! Brr….. I only plant a few things each year because my crop is in containers. I live in a townhouse and I don’t have the space for a large garden. If I did have the space, I’d be out there planting all kinds of things! Your garden sounds like so much fun! Because of California’s drought, our well went dry. It’s probably refilled again, but we’ve had pump problems… We could use city water to water our garden, but it is EXPENSIVE. So, we haven’t planted a garden for about 5 years now :-( Thankfully, we have a real good farmer’s market nearby for those fresh tomatoes, zucchini, strawberries, etc. But I miss having a garden! Too bad that you aren’t able to have a garden. Farmer’s markets are great, though! I visit them occasionally for fresh produce. I’ve never thought of gardening that way, Cecelia. Maybe because I don’t garden. Although I love fresh vegetables. Thankfully, I have several family members and church members who do garden so I still get fresh veggies without all the work. My dad brought me a huge box of sweet potatoes he bought at an auction a few weeks ago. I love them, but there were way more than I could eat so I took some to church to give away. People were asking where they came from. I said I grew them. Several believed me, but I told them I don’t grow anything but weeds. And if it ever gets bad enough where I have to grow my own food, just shoot me because I’m going to die anyway. LOL! You should try planting one thing in a container. Just start small. See what happens! You might be surprised. Do you make sweet potato pies? I love those! I love to garden, though I don’t get to do as much as I’d like. My garden is tiny, messy and a little wild! I have a lot of permanent fruiting plants – a sweet cherry, a sour cherry, and two apple trees, two blueberry bushes, and a lot of raspberries and loganberries (a delicious raspberry/blackberry cross). I have plans to add some new raised beds before the end of spring, one for herbs, the other a mix of veggies and flowers. Autumn, that sounds so awesome! I’ve always wanted a fruit tree in my back yard. Not possible where I live now since it’s a townhouse community and everything is monitored by the homeowners association. If I lived out in the country, I’d be trying to plant myself an apple and a peach tree! Gardening is wonderful, and I used to have a huge garden and grew everything from peanuts to popcorn. But we travel so much now that keeping a garden just doesn’t work. A garden has to be tended, and mine would be neglected. Besides, I haven’t learned the secret of gardening in the desert heat. I grow as much as I am able to can for winter. Usually onions, garlic, lettuce, potatoes, beets, carrots, corn, tomatoes, peppers, cucumbers, green beans, peas, agriculture beans, cabbage, zucchini, yellow squash, herbs, rhubarb, raspberries, fruit trees. Wow, that’s impressive. If I had more time and energy, and space, I’d try and plant a larger garden and do canning! That’d be so much fun! I’ve never had a garden before but if I should I would try tomatoes. Your blog has inspired me to try something different. So glad my blog has inspired you! You should go purchase a tomato plant and see what happens! I’ll bet you’ll get lots of tasty red tomatoes! No garden. My mom has one, though, and loves planting lettuce, peppers, and other yummy produce. Hi, MJSH! thx so much for commenting! Glad to hear your mom likes gardening! 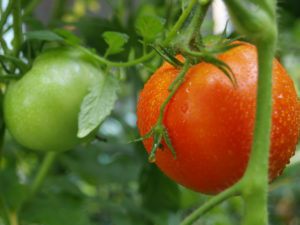 I used to grow tomatoes and peppers every year and have also tried growing cucumbers, broccoli, lettuce, and cantaloupe with varying degrees of success. I haven’t had a garden for the last couple of years though. I tried to grow cukes once, but, I failed. The soil in my pot (I planted it in a container) got really moist and stayed moist, almost water-logged! I know cukes are very watery, so, I suppose I should’ve planted it in the ground!